← Look at this great new site! 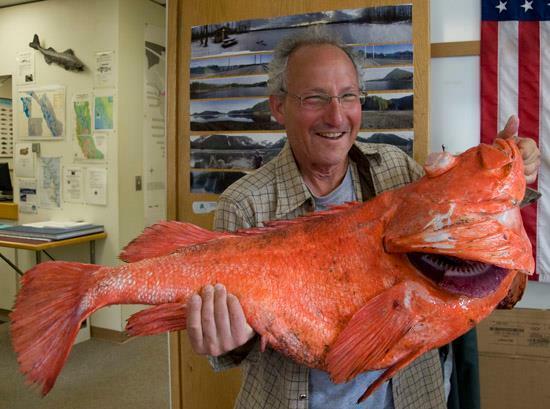 Sport fisherman Henry Liebman, from Seattle, holds his record-breaking shortraker rockfish at the Alaska Department of Fish and Game office.The fish measured 104 centimeters and weighed 39.08 pounds. This is an incredible picture of an incredible fish–a rockfish that scientists estimate was around 200 years old when it was caught in June off Alaska. We’ve been reading and writing about rockfish for quite awhile, but all the ones we’ve seen have been relatively small, especially compared to this one. When all you see is small fish, you don’t really realize how big fish used to be–and that is the point of the shifting baseline theory, which both Daniel Pauly and Jeremy Jackson have written about. If all we see are small fish, then we have no concept of how big fish used to be–and thus we don’t understand how much has been lost. Looking at the size of this fish gives me some insight into why fisheries scientists during the early years thought there was no value to such large fish. During the 1940s, scientists thought that old fish were like old trees, that they were senescent, suffering from the accumulated changes of age, at both the organism level and the cellular level. Large fish tended to produce poor fillets, that were watery or soft. And such a large fish obviously had stopped growing, yet it was still eating part of the food that was available to the population as a whole. Removing the older, less valuable individuals would leave food for younger, faster-growing fish to grow more quickly.It was not until the late 1970s that scientists developed the tools to more correctly age fish like this one. Fish lay down daily growth rings, just like trees. And with the right equipment, the rings can be counted. It’s especially tricky with fish, which lay down layers of growth rings. The new technology showed the rockfish, especially deep water rockfish, were much older than had been suspected–that some lived as long as this one, to 200 years. It took until 1994 before scientists realized that the age structure of the population was also important–and that old females played an outsized role in reproduction, laying larger quantities of bigger eggs, with a higher potential for survival.That’s a trait that is especially useful for a species that does not spawn every year. We don’t know if this fish was a female. We hope it was reaching its natural point of mortality. But we’re grateful that this sports fisherman caught it and photographed it, because we’ll think about the picture every time we read something about rockfish. Berkeley, Steven A., Mark A. Hixon, Ralph J. Larson and Milton S. Love. “Fisheries Sustainability Via Protection of Age Structure and Spatial Distribution of Fish Populations.” Fisheries 29, no. 8 (2004): 23-32. This entry was posted in Carmel Finley, fisheries science, Fishing, History of Science, Maritime History, Ocean fishing, Overfishing, Pacific Fishing History Project, Rosefish, Sebastes rockfish and tagged Fisheries Science, Pacific Fishery History Project, Pacific Ocean Perch, rosefish, Shifting baseline, trawling. Bookmark the permalink.